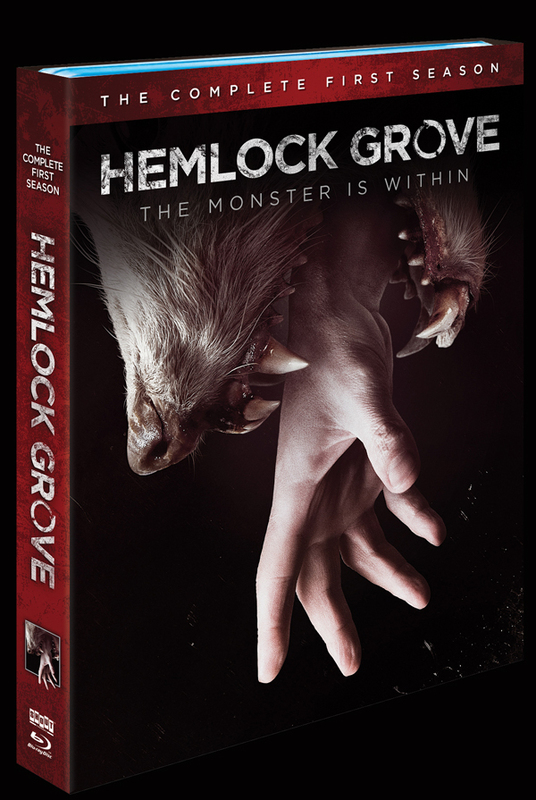 Digi-Schlock: HEMLOCK GROVE, SEASON 1 (Scream Factory 3 Blu-Ray Set) – Schlockmania! When Netflix began streaming entire seasons of television shows, it joined with the “on demand” sections of cable companies to pave a new way in how people viewed episodic television. They boldly took things a step further when they debuted entire seasons of new shows direct to streaming and the success of these shows has further shaken up the television landscape. Hemlock Grove was one of those shows and it’s still there for viewers to watch. However, there is something to be said for watching televisions shows on DVD or blu-ray: it’s the original way to do binge-viewing. A key benefit is that if you throw down for the blu-ray format, you’ll get a better quality A/V experience (high-res physical media still beats high-res streaming in this area) and you can get some extras as well. Hemlock Grove just made its blu-ray debut courtesy of Scream Factory. Its high-definition presentation of the show makes a nice case for blu-ray as binge viewing format: one of the first season’s greatest assets is the stylish digital cinematography of Fernando Arguelles and it looks gorgeous on this set. The colors are rich and the texture are handsomely detailed. 5.1 lossless stereo mixes are provided for each episode and they make solid use of directional effects for the horrific scenes while also spreading around Nathan Barr’s rich musical score to atmospheric effect. The set also throws in a fistful of special features not used for the show’s Netflix run. The first of these is a commentary track on featuring executive producer Eli Roth and actress Lorenza Izzo. Roth talks about the episode with great enthusiasm, doling out plentiful praise for countless cast and crew members, and Izzo supplies some details about the rigors of enacting the big wolf attack scene she appears in. Later in the track, Roth reveals some interesting info about how one particular scene that originally began the episode was later cut into flashbacks inserted in a few key spots. All in all, it’s an amiable listen for fans. The next extras are a series of featurettes, all done in an ‘Electronic Press Kit’ style. “Dysfunctional In Every Way” offers an 11-minute overview of the show with Roth, co-creator Brian McGreevey and producers Deran Serafian and Mark Verheiden as well as several cast members. There’s much talk amongst the creative staff of finding a fresh angle on familiar horror archetypes while the cast members offer brief analyses of their respective roles. An unexpected surprise is learning which cast members have English or Scottish accents in real life! “Fairytales For Adults” continues the talk of horror archetypes in greater detail over seven minutes as well as talk about how Pittsburgh was an influence on the show’s titular town and everyone excitement over the new episodic t.v. paradigm that Netflix offers. 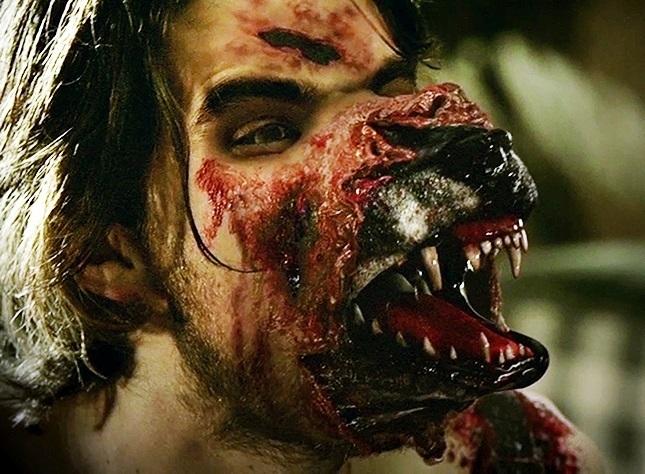 “It Hurts So Good” devotes five minutes to the show’s werewolf transformations. As with other segments, there is much talk of finding a fresh way to do such a scene and this is supported with some interesting behind-the-scenes footage that shows off how the creators combined traditional prosthetics with digital effects. “The Rust Beneath The Surface” is a five-minute piece about how a mixture of unique locations and inventive production design fleshed out the show’s setting. “The Monster Within” spends about six-and-a-half minutes discussing how the show uses the idea of monsters as a metaphor for humanity’s dark side, complete with different actors discussion what different “monster” in their personality that their character has to grapple with. “Anatomy Of A Kill” wraps up the featurettes, with Roth show great glee as he guides the viewer through how’s and why’s behind the murder sequence that kicks off the show. The final extra is a string of trailers and t.v. spots used to promote the show’s Netflix debut. There are about five minutes of these total, with spots ranging from 30 seconds to a minute and a half as they set up the show as a soap opera with monsters. All in all, this blu-ray set offers a quality way for non-Netflix types to catch up with the first season of Hemlock Grove – and those who like the show may want to invest in this set for the bump in A/V quality and the extras. 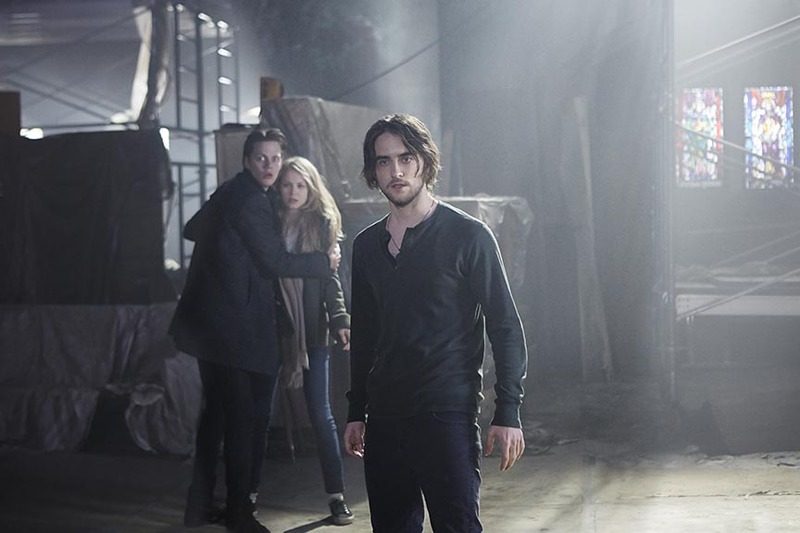 To read Schlockmania’s series review for Hemlock Grove: Season 1, click here.